must sell, so am taking offers, starting at $50 (postage to anywhere in the world included if offer goes over $100). school is starting and I'm taking more classes than usual, so it's going to be pricey... desperately need money to fund my studies! she's got beautiful eyes and symbols, mane + tail appear uncut but a couple of strands in her mane appear longer, like they're uneven or something. she has these weird red'ish splotches on her body that I suspect can be sunfaded, but iceland is not an ideal place to try sunfading so I won't try it. Click on my siggie and visit my Ebay Store! Oh how i LOVE those alternative Birthflowers! little offtopic maybe, but in which country(ies) are they made? Good luck with your sale, SP! 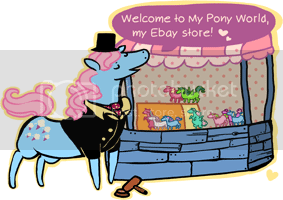 I think I may have some ponies of your want list, I'll have to check and send you a pm!! Pony Fair Australia - Kisscurl's Ebay Sales - Kisscurls WebsiteWanted G3 Accessories! in which country(ies) are they made? yeah, and of course they were sold here in iceland too. :3 back in the 80's we got so many toys in the shops here from denmark. ^^ and from the uk and germany, too. bump! taking offers! please, someone buy her! thanks, ladies! I really hope she finds a good home!